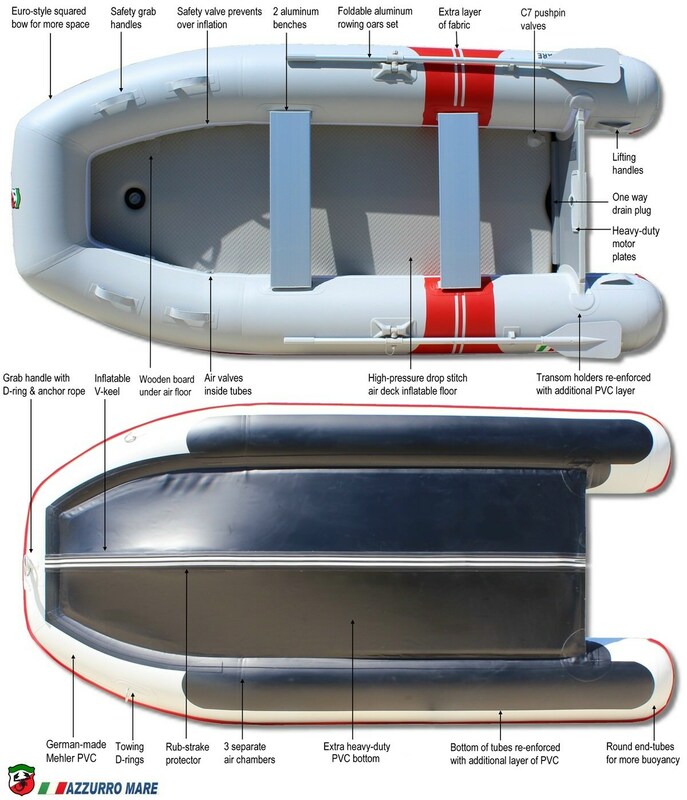 Premium 9.6' AM290 Azzurro Mare Inflatable Boats for Yachts and Sail Boats. 96' Premium Inflatable Boats AM290. 5 Years Warranty! NEW V2.0: Imported from Germany Mehler PVC fabric, heat welded seams and Bravo valves. 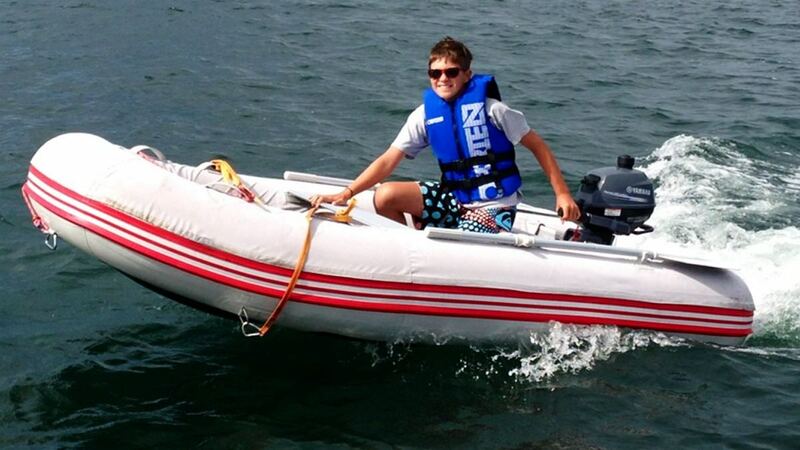 The AM290 inflatable dinghy takes up to a 10 HP short shaft outboard motor and can carry up to 4 people maximum. A reliable dinghy is about the most important piece of equipment that a cruiser can own. With a 10HP outboard motor this boat will fly over the water at a speed of around 20 mph. Great as tender for yachts or sailboats. You can stand on its air floor just the same as you'd stand on a plywood floor. The deflated boat will take as much space as a medium bag. Please note: specifications and details are subject to change without notice. The bottoms of tubes are also covered with an additional layer of PVC. Equipment: aluminum oars, repair kit, foot pump, seat bench and carry bag. Very well made, nice space, gets on plane with two people with a 9.9 and runs about 17 mph. Very nice looking, only. Draw back it’s a bit heavy, very thick bottom, so far very happy. Bought this online to replace my West Marine dinghy. This was less expensive and I was able to compare side by side and the construction of this dinghy is far superior. From the valves to the reinforcement around the transom connection the quality is evident. Mine is left in the sun and the high quality covers are doing a great job at protecting from UV damage. If I ever wear this one out I'll buy another! My old dinghy was becoming an eyesore on the back of my yacht, so I went searching for a new one. As soon as I came across the Azzurro Mare’s on your site, I knew I found the right crafts. These things look beautiful with that square nose and that white and red pattern. The material feels thick and firm, which is exactly what I was looking for. I had it shipped right to the place where I dock my yacht, and everything went perfect. The boat is exactly as pictured on your site. No bait and switch or anything like that. I’ll have this thing forever. I have had this boat for some time now, and have been in it almost every day. I want to tell you that although I had reservations about buying a dinghy for my sailboat without seeing it, it has exceeded my expectations. 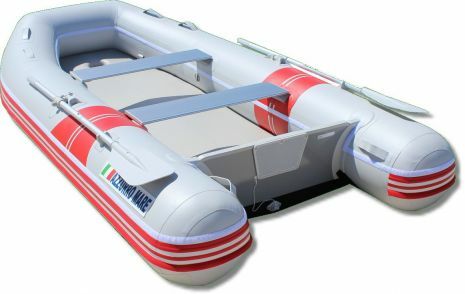 A few of my boating neighbors have recently purchased other brand inflatables and they are all impressed and amazed at the quality and design of the Azzurro Mare at this price. I was torn between this and the Saturn because I liked the grey color of the Saturn better, but now I have come to enjoy the bright red of the Azzurro. The reinforced floor and transom was the tipping point for me, but if the Saturn is anything like this dinghy then I am sure I would be happy with it also.